Scientists at the University of California San Diego School of Medicine and Moores Cancer Center report that a signaling protein that normally suppresses tumors can be manipulated (or reprogrammed) by growth factors, turning it into a driver of malignant growth and metastasis. They published their study (“Convergence of Wnt, Growth Factor, and Heterotrimeric G Protein Signals on the Guanine Nucleotide Exchange Factor Daple”) in Science Signaling. “Cellular proliferation, differentiation, and morphogenesis are shaped by multiple signaling cascades, and their dysregulation plays an integral role in cancer progression. Three cascades that contribute to oncogenic potential are those mediated by Wnt proteins and the receptor Frizzled (FZD), growth factor receptor tyrosine kinases (RTKs), and heterotrimeric G proteins and associated GPCRs [G-protein-coupled receptors]. Daple is a guanine nucleotide exchange factor (GEF) for the G protein Gαi. Daple also binds to FZD and the Wnt/FZD mediator Dishevelled (Dvl), and it enhances β-catenin–independent Wnt signaling in response to Wnt5a-FZD7 signaling. We identified Daple as a substrate of multiple RTKs and non-RTKs and, hence, as a point of convergence for the three cascades. We found that phosphorylation near the Dvl-binding motif in Daple by both RTKs and non-RTKs caused Daple/Dvl complex dissociation and augmented the ability of Daple to bind to and activate Gαi, which potentiated β-catenin–independent Wnt signals and stimulated epithelial-mesenchymal transition (EMT) similarly to Wnt5a/FZD7 signaling,” write the investigators. 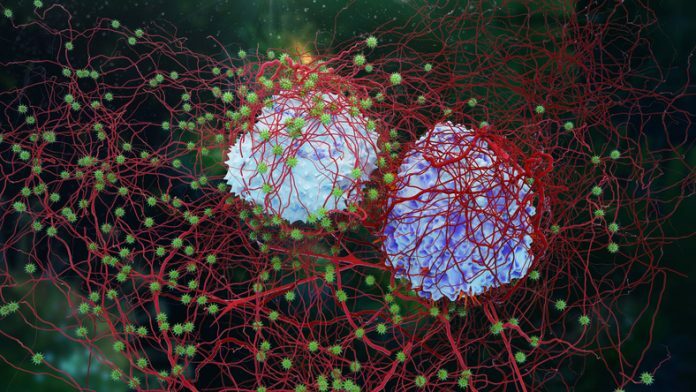 “Although the multiple signaling pathways in cells are typically conceptualized as independent entities, it is their complex crosstalk that shapes many aspects of cancer,” said senior author Pradipta Ghosh, M.D., professor of medicine and cellular and molecular medicine at UC San Diego School of Medicine. Building upon earlier work published in 2015, Ghosh and colleagues investigated a protein called Disheveled-associating protein, or Daple, which is produced by nearly all healthy cells in the body and is well recognized for its role in helping cells in different tissues coordinate processes, such as development and maintenance of organs. At the time, however, it was not clear how the tumor suppressor could turn rogue. In their new work, the team found the culprit—an overabundance of growth factors in the tumor microenvironment. The Wnt signaling pathway in cells is fundamental in embryonic development, helping direct the organization of cells, their functions, and their fates. Later, it is essential for tissue homeostasis or equilibrium. Normally Daple, which operates within the Wnt pathway, serves to prevent abnormal growth and stays bound to the protein Disheveled, which acts as a brake on Daple. But as normal tissue becomes cancerous, rising levels of different types of growth factors hijack this system, disengaging Disheveled from Daple, disabling the brake, and unleashing Daple. Instead of suppressing tumors, Daple begins to promote tumor growth and spread. The researchers found that in colon cancers in which Daple is highly expressed with concomitant high growth factor signaling, there was a high risk for tumor recurrence compared to all other tumors. “This work not only brings out the complexity of crosstalk between major signals that drive cancers, but also defines how such crosstalk triggers a Jekyll-to-Hyde transition in Daple at an atomic level, and what that means for patients,” said Ghosh.